From the CloverDX perspective, select File → New → CloverDX Server Project. CloverDX Server Project wizard will open and guide you through the creation of the server project. The first step is to create a working connection to the CloverDX Server. 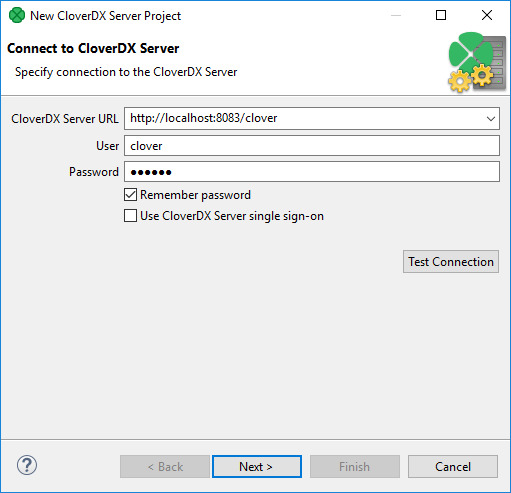 Fill in CloverDX Server URL, User and Password. Since 5.2.0, CloverDX supports single sign-on (SSO) by the Security Assertion Markup Language (SAML) 2.0 protocol. To use SSO, check the Use CloverDX Server single sign-on option. Once selected, a new option appears which allows you to log in as different user if checked; if unchecked, CloverDX Designer attempts to log in using credentials of the last signed-in user. Note that if you use the SSO login option, you will be redirected to the identity provider's sign-in page. For more information, including configuration properties for setting up SAML, see the section Administration > Users and Groups > SAML Authentication in the CloverDX Server documentation. You can verify the validity of the connection using the Test Connection button. Once a connection to the CloverDX Server is established, continue with the next step. 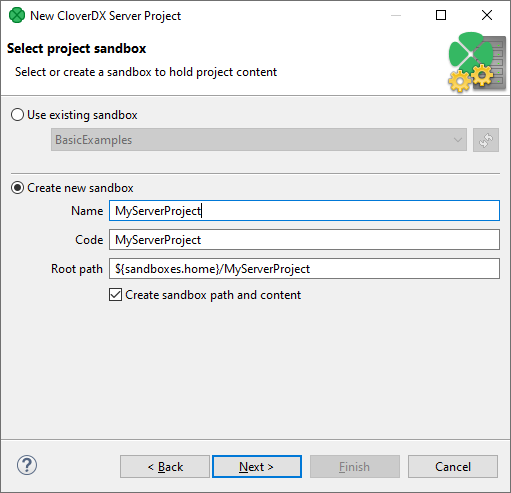 The second step of the wizard is to select an existing or create a new CloverDX Server sandbox. The sandbox will correspond to the project. Use an existing sandbox or create a new one. In case you decide to create a new sandbox, the form is similar to the one present in the CloverDX Server web interface. Refer to the CloverDX Server manual for further description on sandbox properties. To create a project which only has data on the remote server, tick the Do not cache sandbox files locally checkbox. This type of server project is known as RSE Server Project. In CloverDX 4.1.x and earlier, this project type was the only one available. One sandbox can be connected to a single workspace project only. The Type (shared/partitioned) option is specific for CloverDX Cluster. Refer to the CloverDX Server manual for a description of sandbox types and their specific properties. In clustered environment, the shared sandbox type is the proper one to be bound to CloverDX Designer project, allowing the user to define and execute data transformations. Sandboxes of other types can be connected to workspace projects, too, but their purpose should be data access and distribution to the Cluster. Press the Next button to create a new sandbox. The last step is to specify the name of the new CloverDX Server project. Keep the other values (Location and File system) unchanged. 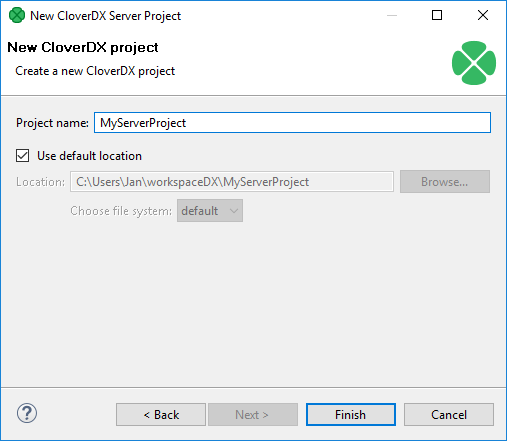 Click the Finish button to create a CloverDX Server project.